Blue Sky Propane is a mobile platform for refilling propane LPG. 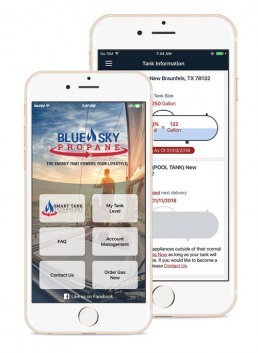 It lets you automatically monitor your propane LPG tank’s fuel level 24x7, check gas consumption, order refills, view billing history and do much more. Over 70M people in the United States use propane for their household heating, grilling and commercial purposes. They all have the same problem: They all run out of propane before having another tank ready for them. Since, they have no ability to see how much propane is left, Blue Skye saw a huge opportunity to build a smarter propane tank. 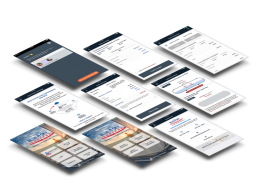 Blue Sky Propane reached out to us to help them build a digital companion to their physical propane tank, that gave their users real-time insights on their tank levels, as well as the ability to re-order and pay for their propane all within a mobile app. 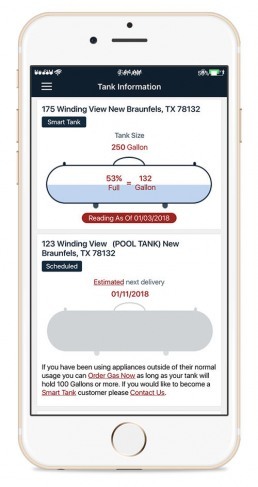 Since the digital solution has near real-time data to your propane levels, we created the ability for the system to automatically re-order, or schedule a time to get your propane tanks refilled. Using TouchID biometrics, users are able to login with their fingerprint recognition feature. The solution alone has resulted in happier customers & more predictable revenue.